I popped along to the Estuary Festival 2016 at Tilbury Cruise Terminal this morning, but I have to admit I was more interested in the buildings than the events. Whilst hanging out on the floating pontoon I heard the bells of (probably) St. George’s Church in Gravesend ringing out, so decided to record them. But, some of the staff were preparing for a cruise ship to arrive, and their activities soon became the dominant sounds. 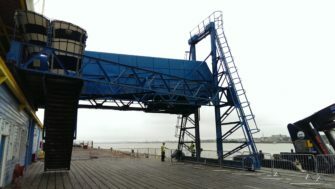 Firstly they removed some chain fencing before ‘driving’ the moveable staircase along the pontoon. I went to that, on the friday, too much to see in the time we had. Technically Cruise Ferry Terminal is accurate but it was built as, The Floating Passenger Landing Stage, The Port of London Authority has a definitive list of berths and Tilbury is still, Tilbury Landing Stage but you’ll often hear it just called Tilbury Stage. Sydney has its Overseas Passenger Terminal, Liverpool has The Pier Head and Prince’s Landing Stage, Harwich has Parkeston Quay, Hamburg has The Saint Pauli Landungsbrücken and Überseebrücke, Rotterdam, New York, Hong Kong, and so on and so forth, all built with passenger terminals and landing places before cruising existed and, this part of Essex has a Floating Passenger Landing Stage.